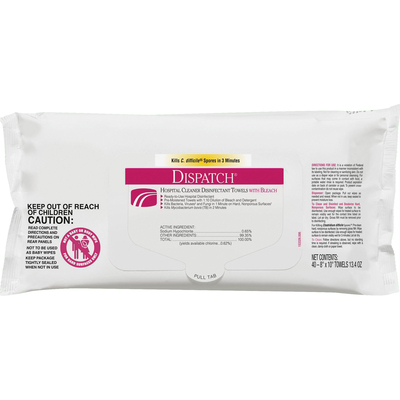 Hospital Cleaner Disinfectant Towels With Bleach Provide Fast-Acting, One-Step Cleaning And Disinfecting To Kill 99.99 Percent Of C. Difficile Spores In 3 Minutes In The Presence Of Three-Part Organic Soil Load. Powerful Formula Eliminates Compliance Risks And Labor Costs Associated With Dilutable Disinfectants. A Special Anticorrosive Ingredient Allows This Cleaner To Be Less Damaging To Surfaces Or Equipment Than Conventionally Prepared Bleach Solutions. Ready-To-Use Design Eliminates Compliance Risks And Labor Costs Associated With Maintaining Disinfectant Dilution Systems. Disinfectant Towels Are Designed For Use In Commercial Settings..
Hospital Cleaner Disinfectant Towels With Bleach Provide Fast-Acting, One-Step Cleaning And Disinfecting To Kill 99.99 Percent Of C. Difficile Spores In 3 Minutes In The Presence Of Three-Part Organic Soil Load. Powerful Formula Eliminates Compliance Risks And Labor Costs Associated With Dilutable Disinfectants. A Special Anticorrosive Ingredient Allows This Cleaner To Be Less Damaging To Surfaces Or Equipment Than Conventionally Prepared Bleach Solutions. Ready-To-Use Design Eliminates Compliance Risks And Labor Costs Associated With Maintaining Disinfectant Dilution Systems. Disinfectant Towels Are Designed For Use In Commercial Settings.